Released last month by Shout! Factory, here is another great disc from what is probably my favorite line of DVDs out there - Roger Corman's Cult Classics. This line features films either produced, directed or distributed by Roger Corman over the last 50 years (though most of the titles are from the 70s and 80s). 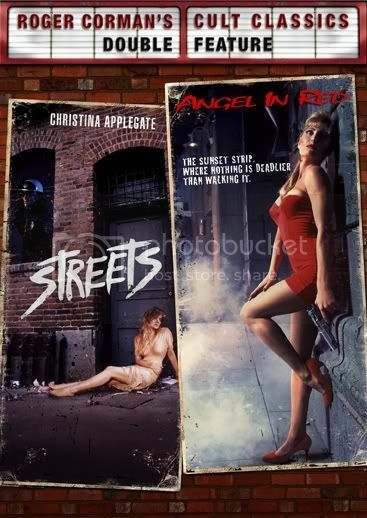 Streets and Angel in Red were both released in the early 90s and both deal with similar themes of trying to make ends meet in the slums, doing what ever you have to do to survive. Streets stars a young Christina Applegate as Dawn, a teenage streetwalker who we later find out is also a heroin addict. She witnesses another prostitute being attacked and after being spotted by the attacker, she narrowly misses being killed. A young runaway named Sy (David Mendenhall), who is aspiring to be a musician comes to her rescue and together they wander through the dangerous streets trying to avoid the attacker, who is looking for them....and who is also a cop! Angel in Red tells the story of Mickie (Leslie Bega of the Sopranos fame), a young streetwalker who lives with her brother Robby (Jason Oliver). Robby was abused by their father and now has brain damage. Sharkey (Jeffrey Dean Morgan in his screen debut) plays Mickie's dangerous pimp Sharkey, who Mickie loves and Robby looks up to as a father figure. After beating up one of Mickie's prostitute friends and after another gets beat nearly to death for not making enough money, they try to leave Sharkey which starts him on a rampage. Streets and Angel in Red both provide a frightening look into the dark underbelly of life on the streets. Streets has a great cast, an interesting story and a lot of action. Applegate proves that she is more than a one trick pony by displaying a lot of emotion and not just being "the dumb blonde". David Mendenhall and Eb Lottimer also do a more than adequate job supporting Applegate. Angel in Red, which is actually a remake of another Corman Classic film, 1985's Streetwalkin' (starring Oscar winner Melissa Leo and Pet Semetary's Dale Midkiff). Though basically a re-tread of the original with not much more to add, the main standout in the film is a very young Jeffrey Dean Morgan who plays the psychotic pimp Sharkey. Though Dale Midkiff's performance in Streetwalkin' is terrifyingly brilliant, Morgan definitely holds his own. Interestingly enough, director Katt Shea went on to popularity with a few more films with women as the leads (Poison Ivy with Drew Barrymore and The Rage: Carrie 2).